UF Health Shands was recently named on the Becker’s Healthcare 2018 list of 100 Great Hospitals in America. “Our physicians and hospital staff are passionate about delivering the best possible medical care and results for our patients. 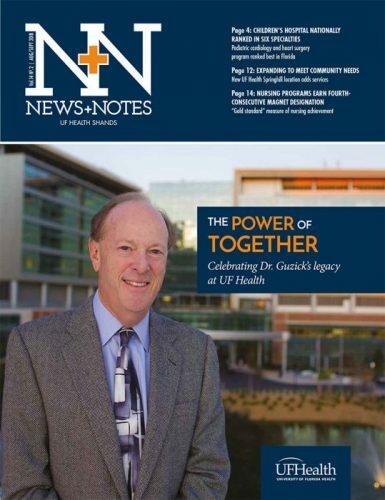 Their skill, dedication and compassionate service is at the heart of all our accomplishments and continual progress,” said UF Health Shands CEO Ed Jimenez. To be included among those recognized, Becker’s looks at the hospitals’ rankings in U.S. News & World Report Best Hospitals listings and their nationally reported patient outcomes data. UF Health Shands is also included in Becker’s 2018 Top Places to Work in Healthcare for supporting workforce diversity, staff engagement and professional growth. In addition to having multiple adult and pediatric specialties included among the nation’s best in the U.S. News & World Report Best Hospitals and Best Children’s Hospitals rankings, UF Health Shands has had four consecutive Magnet designations from the American Nurses Credentialing Center, the nursing profession’s top honor for quality patient care and nursing practice. Visit beckershospitalreview.com/lists/100-great-hospitals-in-america-2018.html for the full listing.